This is what we need to fill our February with – bold – bright – beautiful – fresh and tasty fruits and vegetables – really don’t they have the ability to transport you to warmer weather!? This is sort of a dual post – we use this gorgeously satisfying salsa on our Baked Fish Tacos – that recipe is going to follow in the next day or so. Bold, bright and beautiful to say the least Mary! Great salad, we eat fresh salad with dinner 6 out of 7 nights a week. Fresh, crisp and deliciously healthy too. WOW! What a beautiful picture. I want abowl of this goodness now! Just what I need to brighten up a dreary January diet. I can’t wait for the fish taco recipe! LOL! Time flies when you’re on a diet and going through duck fat withdrawl…..congrats on the FB Top 9 with this one. It sure looks pretty next to the other 8! You have everything I like in that salad! hi guys. i’m looking foward to the fish taco. It’s in que for Saturday Sister! Oooh, that looks amazing. All my favorite flavors in one healthy bowl! Mister – Don’t you live in Sunny CA!? Winter! WHAT winter!?!?! Such a refreshing salad! 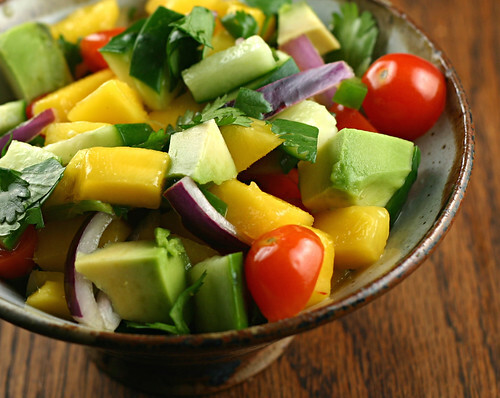 I love the combination of avocado and mango! Wow, I never thought a salad could look so appealing! Brightly coloured ones are the best, this looks so tasty! You guys always have the most amazing food. This looks amazing and healthy.:))))mmmh. Wow what a delicious looking salad. I love the colors and its so healthy cant beat this nice job Mary! That really does look like summer which I’m missing after this long, dreary winter. Please don’t quote me on that when I start complaining in April that the temperature is already in the 90’s here in Houston. Beautiful recipe as always. This looks wonderful! I can get all the ingredients from the fruit truck that has been stopping here twice a week now. I’m waiting for the fish recipe……maybe I can get that from the fish truck. I’m just saying, you should take a winter vacation here in Roatan where it’s 80 degrees with a gentle breeze. Go ahead – rub it in Patty! Oh my gosh, I love color in food. Color in food means it’s good for me. I can’t wait to try this. Great salad. Very colourful, vibrant. It’s winter and I am more into soups during winter, but for my outdoor barbecues in Summer, this will make my top list for sure. I guess the key thing with such salad is to avoid overwhelming vinegary touch. Probably, barely any dressings is the way to go actually. The best! :) love it sooo much! I love the colours. So fresh and summery! Amazing– oh, how I wish it was summer!! ill make this for valentine…thanks! We’ve made this recipe at least twice a week since we first tried it! Today the neighbors are having a wedding and they’re serving it! Everyone in Roatan that’s tasted it wants the recipe. I made this tonight, served over grilled Halibut. It was PERFECT! HAPPY! So glad you liked it. The funny part, we both had the same thing for dinner – only mine was over grilled shark. Having this for dinner tonight with Swai fillets. Swai? Yes. I’d never heard of it, either. It’s a delicious fish, though, and I’m sure this salsa will be perfect with it!